Congratulations to Shelly Lowenkopf whose new book Love Will Make You Drink and Gamble, Stay Out at Night made the top 100 of all books in Amazon’s Best Sellers Rank last weekend. From Shelly’s writing-for-hire dayCongratulations to Shelly Lowenkopf whose new book Love Will Make You Drink and Gamble, Stay Out at Night made the top 100 of all books in Amazon’s Best Sellers Rank last weekend. Shelly Lowenkopf has held major editorial positions with general trade, mass market paperback, literary, and scholarly book publishers in addition to executive editorial participation in special interest, literary, and genre fiction magazines. Those companies include: Sherbourne Press (Editor-in-Chief); Dell Publishing (Director, Los Angeles office); Clio Books (Editor-in-Chief); Ross-Erickson (Editor-in-Chief); and, Capra Press (Advisory and Acquisitions Editor). He has seen over seven hundred book projects and hundreds of short story and essay projects through the publishing process. Currently a freelance consultant and teacher, his clients include novelists, retired and active academics, and the humorist creator of one of the most popular television series of all time.Lowenkopf taught courses in short story, novel, dramatic writing, editing, genre fiction, and revision at the graduate level in one of the most prestigious writing programs in America at University of Southern California, where he was given a Lifetime Teaching Award. He has been a visiting professor at the College of Creative Studies, UCSB, since 2011. He is a past regional president of the Mystery Writers of America; his book reviews have appeared in the Philadelphia Inquirer, the Fort Worth Star-Telegram, The National Catholic Reporter, The Los Angeles Times, the Los Angeles Herald-Examiner, Publishers’ Weekly, the Santa Barbara News-Press, and the Santa Barbara Independent. He has been the weekly reviewer for the Montecito Journal since 2005. 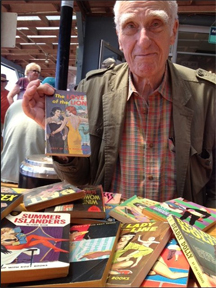 Lowenkopf has had over 35 books published, along with short fiction, pulp novels, essays and reviews. His most recent book, The Fiction Writer’s Companion (Available on Amazon), is a guide to terms, concepts, and forms related to storytelling. Read Melinda Palacio’s interview with Shelly Lowenkopf on La Bloga. Long time no see, Shelly. Remember “Encounters With Aliens: UFOS and Alien Beings in Science FIction” which was remaindered without tellinng the editor? I’d be interested in chatting with you about that. You were recommended by Kathleen O’Donnell via Linked-In. I wrote a novel that is now up on Kindle and Nook. I believe that spelling, grammar, sentence structure and mechanics are pretty O.K. Certainly, you will find lots I have missed. It is close to 104,000 words. I want someone like yourself to improve the writing style and perhaps fix scenes. I also need a good query to return to my agent search. My literary agent was working independently and died after taking-on my project.